To enhance your account's security, set up two-factor authentication. 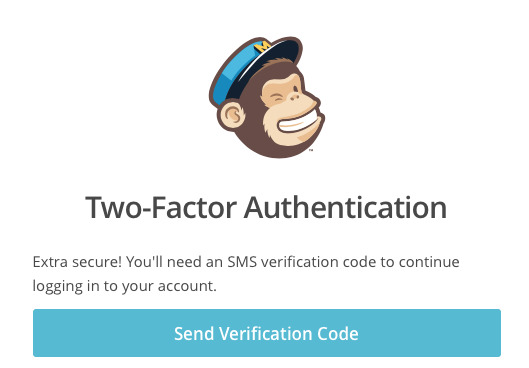 Two-factor authentication requires two forms of identification to access to your account: your Mailchimp login credentials, and one-time passcode you receive via text message. In this article, you'll learn how to set up SMS two-factor authentication. We offer a 10% security discount for 3 months when you use two-factor authentication. To earn the discount, all Owners and Admins in your account must enable two-factor authentication. Each user will be authenticated individually. If you prefer to use an authenticator app on your smartphone or tablet, try an app like Authy or Google Authenticator for your two-factor authentication. Learn what to do if you lose your mobile device. To set up SMS two-factor authentication for your Owner or Admin account login, follow these steps. 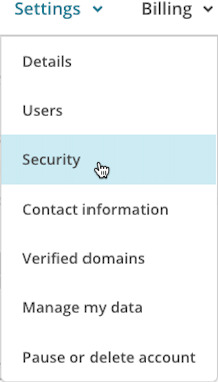 Click the Settings drop-down menu and choose Security. Under Verify identity via SMS, click Enable. In the Select Country drop-down menu, choose the country associated with your phone number. Check the box next to Enable two-factor authentication using this phone number. 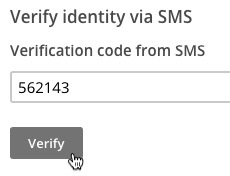 Click Verify, and we'll send an SMS verification code to your mobile device. Check your mobile device for a text message, and input the passcode you received in the Verification code from SMS field. 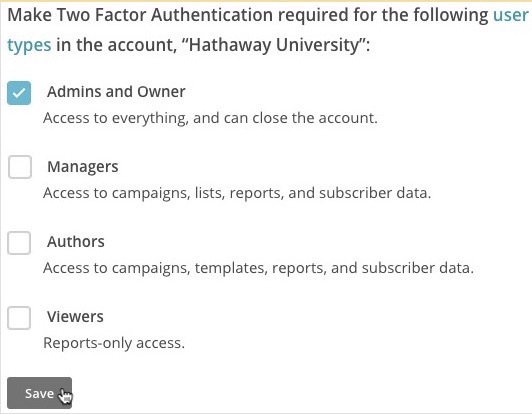 Under Enable Two Factor Authentication for these accounts, check the box next to your account, and click Save. Choose the user type that should require two-factor authentication at login, and click Save. 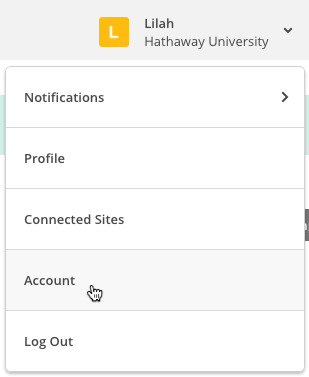 When you log in to Mailchimp from now on, you'll still input your credentials and click Log In. Then, we'll ask for the SMS passcode we sent to your mobile device before you can access Mailchimp. We strongly recommend that you use two-factor authentication to protect your account data. But if you no longer want to use it to log in to your account, Owners and Admins can turn it off on the Security page in your account. To disconnect SMS Two-Factor authentication, follow these steps. Uncheck any boxes next to accounts and user types that require two-factor authentication, and click Save. Mailchimp offers discounts for nonprofits and accounts using two-factor authentication. There are a few ways to troubleshoot if you're having problems with two-factor authentication on your Mailchimp account.